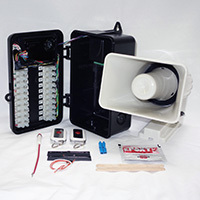 Each MG0 Series boat alarm is hand assembled in the USA. All systems are encapsulated for protection from the harsh marine environment. The systems can accept all "normally-open" security devices. These devices will automatically trigger an armed system. Alarm condition will last for two minutes. During this time, the siren will sound and 12-volt lights will activate. After two minutes the system will reset and wait for another violation. Arming and disarming the system is accomplished using wireless keychain transmitters.